There’s no question that a cat’s overall health is tied to their environment. Of course, there are other things that are just as important, such as vaccines and parasite prevention, nutrition, and dental care, but the link to feline happiness is undoubtedly their surroundings. Remember, part of a cat’s happiness at home has to do with a low-stress dynamic. 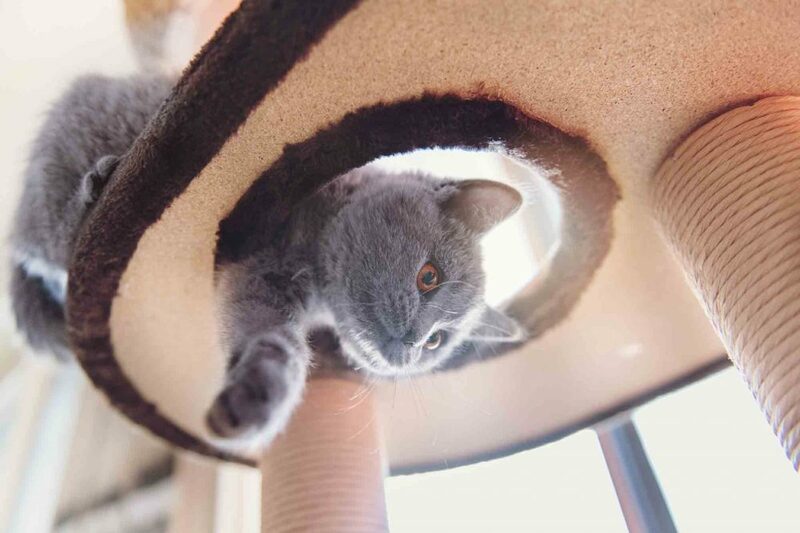 If you notice that something seems to bother your cat, try to remove or minimize it. Try to understand what your cat’s preferences are and accomodate them from there. Cats are super intelligent animals and they like a challenge. Perhaps, they’d like clicker training as a shared experience with you. Or, crate training is a fabulous opportunity to work their mind, and provide a safe place for them to go to when needed. Likewise, a clean litter box is imperative and fresh cool water rounds out a cat’s general well-being at home. You can even build it large enough for you to hang out, too. Install a comfy chair that you and your cat can cuddle in. Check out these great examples. Our caring staff is always here to help. Please let us know if you have any other questions about cat enrichment. Good luck. Meow!